Hundreds of Gold, Platinum and Grammy winning albums have been produced in studios that use Sound Anchor stands! 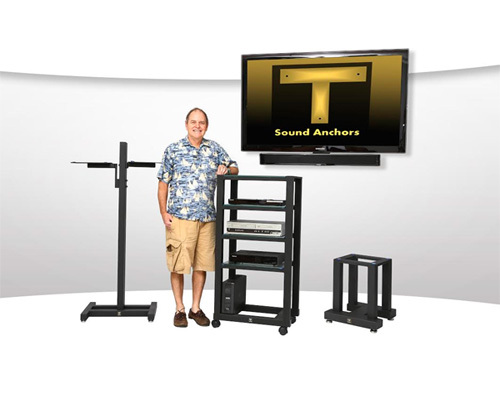 Sound Anchors is a small firm with one simple goal. That goal is to provide the best stands and mounts possible. Sound Anchors has maintained this goal since our inception in 1984 and we have developed a reputation for performance, durability and value. In 1992 we started adapting our home designs to studio and commercial applications. In 1994 we developed the first serious adjustable height stands for studio use. The success of this stand led to the development of a complete line of studio stands. We have recently added stands and mounts for flat panel LCD and plasma displays to our product lineup under the Redmount name. Sound Anchor and Redmount products are designed and manufactured in Palm Bay, Florida U.S.A. using American parts and skilled American labor. Next time that you need to purchase high quality stands or mounts please consider Sound Anchors.